Purpose: To provide and maintain a welcoming community that strengthens our relationship with God, deepens our connection with each other, and cultivates our calling into the world. We strive to be a safe space for any and all students in need of respite and community. Dinner is served at 6:00. Those with an exam or other evening commitment are placed at the front of the line. 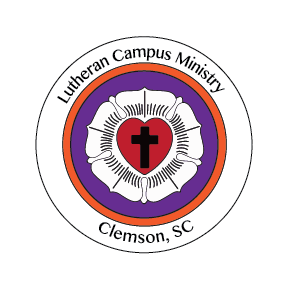 It is now possible for you to make on-line gifts in support of Lutheran Campus Ministry-Clemson. You can use a credit card, electronic transfer, or e-check. The link takes you to a page associated with University Lutheran. You will see the Campus Ministry option there. Donations can still be directed to General Fund, Endowment, or Scholarships. Lutheran Student Movement-USA is a partner with Reconciling Works.